The film version of Atlas Shrugged was financed by outsiders and made, despite Hollywood, which did everything it could to suppress and bury it, as a small-scale, noticeably inexpensive production. 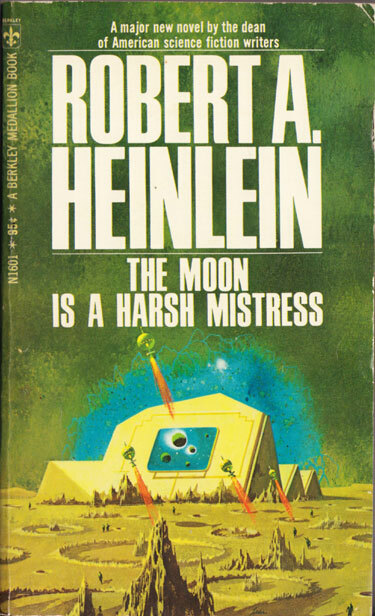 Now, another major libertarian classic, Robert A. Heinlein’s The Moon is a Harsh Mistress, portraying a lunar revolt against earthly big government has been scheduled to be made by a major studio with a name director. Bryan Singer is tackling an adaptation of The Moon is a Harsh Mistress, based on the classic sci-fi book by Robert A. Heinlein. Twentieth Century Fox recently picked up the movie rights. Arrow executive producer Marc Guggenheim will adapt the book for the project, which will be titled Uprising. Singer is producing with Lloyd Braun of Whalerock Industries and Thor Halvorssen. Executive producers are Andrew Mittman and Jason Taylor, and Alex Lloyd and Richard Martin are co-producing. Heinlein’s 1966 sci-fi novel centers on about a lunar colony’s revolt against rule from Earth. The novel was nominated for the 1966 Nebula award (honoring the best sci-fi and fantasy work in the U.S.) and won the Hugo Award for best science fiction novel in 1967. An adaptation has been attempted twice before — by DreamWorks, which had a script by Ted Elliott and Terry Rossio, and by Phoenix Pictures, with Harry Potter producer David Heyman attached — but both languished and the rights reverted to Heinlein’s estate. Several of Heinlein’s novels have been adapted for the big and small screen, including the 1953 film Project Moonbase, the 1994 TV miniseries Red Planet, the 1994 film The Puppet Masters, and — very loosely — the 1997 film Starship Troopers. We should simply adopt Rand Simberg (and Robert Heinlein)’s suggested policy of earned citizenship, with respect to voting. * The right of citizenship by birth on a country’s soil. In the science fiction novel Starship Troopers, the late great Robert Heinlein put forth a different notion of citizenship — not one of a birthright, but an earned status. In this view, more republican (and in better keeping with the intent of the Founders), he made a useful distinction between being a citizen and being a civilian. He made citizenship a separate issue from whether or not one is entitled to live and work in the country, or even receive its benefits (even including welfare). Perhaps to be a citizen should be defined as being able to partake in the running of the country, and those unwilling to do the things necessary to become one will have to accept the decisions of those who have done so, or find another nation in which to reside, one perhaps more congenial to their lack of civic responsibility. That is, citizens would be eligible to vote and run for or be appointed to public office — civilians would not. In Heinlein’s formulation, two years of government service — sometimes, but not invariably, military service — was a requirement of citizenship. Some have mistakenly declared his notion fascist, but that is nonsense, as fascism is much more than militarism (assuming that one even accepts that Heinlein’s society was militaristic — I don’t necessarily). Ralph Peters takes the Heinleinian view of our Taliban adversaries. A fundamental reason why our intelligence agencies, military leaders and (above all) Washington pols can’t understand Afghanistan is that they don’t recognize that we’re dealing with alien life-forms. Oh, the strange-minded aliens in question resemble us physically. We share a few common needs: We and the aliens are oxygen breathers who require food and water at frequent intervals. Our body casings feel heat or cold. We’re divided into two sexes (more or less). And we’re mortal. Regarding Planet Afghanistan, we still hear the deadly cliché that “all human beings want the same basic things, such as better lives and greater opportunities for their children.” How does that apply to Afghan aliens who prefer their crude way of life and its merciless cults? When girls and women are denied education or even health care and are executed by their own kin for minor infractions against the cult, how does that square with our insistence that all men want greater opportunities for the kids? What about those Afghan parents who approve of or even encourage suicidal attacks by their sons? This not only confounds our value system, but defies biological reason. So: These humanoid forms with which we must deal don’t all want or value the same things we do. They form different social aggregates and exchange goods and services within wildly different parameters (and exhibit hypocritical sexual tastes that diverge from procreative mandates – ask our troops about that). These alien tribes seek to destroy physical objects and systems valued on Planet America. They perceive time differently. They treat other life forms more harshly than we do. Their own lives are shorter, with different arcs. They quite like our weapons, though . This is a “war of the worlds” in the cultural sense, a head-on collision between civilizations from different galaxies. And the aliens don’t come in peace. Taylor Dinerman, in the Wall Street Journal, commemorates Heinlein’s centenary. Brian Doherty, in the LA times, pays tribute on the occasion of Robert A. Heinlein’s upcoming 100th birthday. The science fiction writer Robert A. Heinlein was born in Missouri, and his fiction was mostly set in the future and on distant planets. But there’s no question that Heinlein — born 100 years ago this week — was one of Southern California’s great prophets. He lived in Los Angeles in the 1930s and ’40s, and first turned to writing because of looming mortgage payments after his failed campaign in 1938 to represent Hollywood in the Assembly. 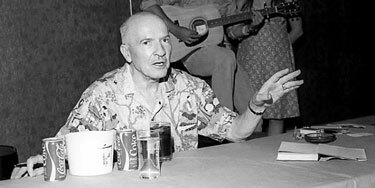 Though he would later become a great inspiration to libertarians, Heinlein was then an active member of novelist Upton Sinclair’s popular quasi-socialist “End Poverty in California” movement. From the beginning of his career as a writer in 1939 (when he published his first story, “Life-Line,” in Astounding Science-Fiction magazine), Heinlein was one of the field’s masters. Before that, science fiction had been mostly either a heavy-handed and didactic genre or one concerned with unsophisticated fantastic adventure tales. Heinlein added sophistication and realism, creating a future world that seemed everyday and lived-in, not impossibly distant. He treated rockets and space travel as matter-of-fact details of human life — as Heinlein believed they would and must become. California, and specifically Southern California, was key to Barry Goldwater’s surprising 1964 GOP nomination victory. Goldwater’s rough-hewn combination of a crusty, antigovernment attitude and extreme bellicosity against communism — which he saw as an unacceptable threat to American individualism — resonated deeply in Southern California at the time. But the Goldwater surge was preceded by a mini-movement Heinlein tried to create in 1958 with the “Patrick Henry League,” dedicated to the notion that the truest expression of U.S. liberty was preparing for a fight to the finish with international communism. Although science fiction’s visions and handling of character have become more complex and sophisticated in many ways since Heinlein’s day, his wide-ranging speculations about human futures created a still-valuable mix of ideas and entertainment. In his peculiar and unprecedented combination of rocket visions, a tough-minded individualism respectful of the military and iconoclastic free living, Heinlein is truly the bard of Southern California. an engineering culture has developed in recent years in which the object is to “hide the works,” rendering the artifacts we use unintelligible to direct inspection. Lift the hood on some cars now (especially German ones), and the engine appears a bit like the shimmering, featureless obelisk that so enthralled the cavemen in the opening scene of the movie 2001: A Space Odyssey. Essentially, there is another hood under the hood. This creeping concealedness takes various forms. The fasteners holding small appliances together now often require esoteric screwdrivers not commonly available, apparently to prevent the curious or the angry from interrogating the innards. By way of contrast, older readers will recall that until recent decades, Sears catalogues included blown-up parts diagrams and conceptual schematics for all appliances and many other mechanical goods. It was simply taken for granted that such information would be demanded by the consumer. A decline in tool use would seem to betoken a shift in our mode of inhabiting the world: more passive and more dependent. And indeed, there are fewer occasions for the kind of spiritedness that is called forth when we take things in hand for ourselves, whether to fix them or to make them. What ordinary people once made, they buy; and what they once fixed for themselves, they replace entirely or hire an expert to repair, whose expert fix often involves installing a pre-made replacement part. So perhaps the time is ripe for reconsideration of an ideal that has fallen out of favor: manual competence, and the stance it entails toward the built, material world. The late Robert A. Heinlein agreed with him. –Robert A. Heinlein, The Notebooks of Lazarus Long, 1978. Hat tip to Tim of Angle. the Archives of Never Yet Melted in the 'Robert A. Heinlein' Category.